Saturday evening, sitting in the domestic airport lounge feeling miserable with flu and dreading the flight ahead. Sunday morning, all drugged up, doing a workshop in Melbourne. Cutting stencils, printing up wallpaper [!]. Sunday evening, home again with my roll of bespoke wallpaper under my arm. Wrecked and bemused by that surreal blip of flu-hazed activity. 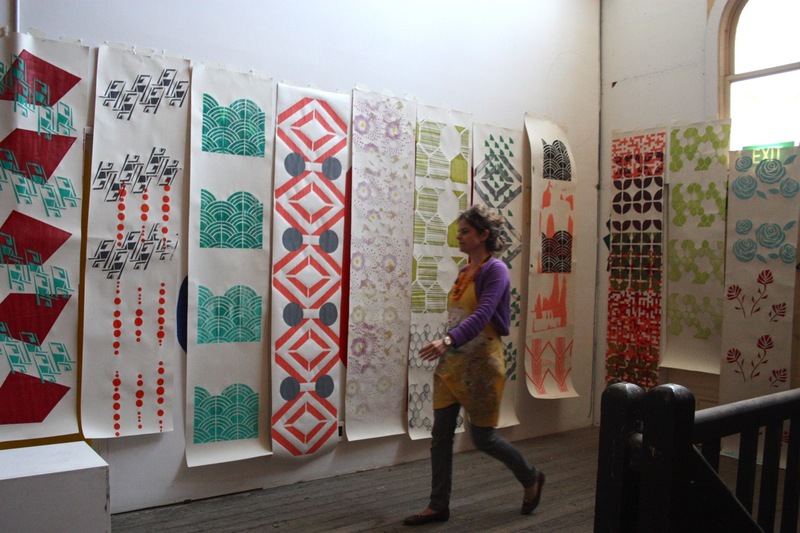 Very inspiring workshop run by the UK-based Australian textile designer Clara Vuletich - her hand printed, layered, non-aligned wallpapers are just beautiful. I know the word is spreading about Harvest Textiles who ran this particular workshop and I join the many who praise the talents and professionalism of the serene Emma. Really hope I didn't infect anyone with my germs. Would have been very sorry to miss this event. I am so glad you went! Those Harvest girls rock! I couldn't go along as I'm in Kyoto (I'm not complaining really!) but am happily admiring the pics on your blogs and Harvest's. oh!!! i would have LOVED to have gone... BUT did love ur work as seen in Made by others, thanks for the tip.. It wasn't too bad - I wasn't as sick as you. The headache was the worse - thankfully passed yesterday. take care!